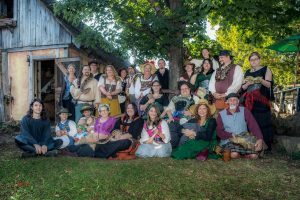 The 2016 Minnesota Renaissance Festival is held weekends August 20th through October 2nd, including September 5th – Labor Day and September 30th – Festival Friday. If you are interested in volunteering for the 2016 season, please email cottage@mnherpsoc.org for additional information and to let us know which days you would like to attend. We would prefer that you contact us no later than the Tuesday before the weekend that you intend to come out, particularly if it is your first visit. Additional information can be found on the RenFest forums (members only). Please be sure to visit the forums for the most recent updates on hands on policy and the MHS insurance requirements. Como Cottage was originally built by Como Zoo to educate people about animals while stepping back into the 16th century during the seven weekends of the fall Renaissance Festival. In 1997, MHS took sole responsibility for the cottage after years of sharing with Como Docents. The volunteers dress in period costumes. If costumes are needed, MHS maintains a large wardrobe of renaissance clothing. After working a portion of the day for MHS, volunteers are free to experience the sights and sounds of the realm. This is a very fun and popular event. Also… Minnesota Renaissance Festival has extended their current least through 2019!! We have a few more years to enjoy our current beautiful sight!